The Amish Asheville Fanback Windsor Dining Chair features one of our favorite Windsor makeovers and we hope you'll love it too! The chair features slender spindles with turned chair posts and a sculpted chair crown that curves upward. This tiny curve gives this Windsor chair a creative lift! Turned legs and a scooped seat finish off the display. The comfort is built right in by Amish woodworkers who cater to every detail. 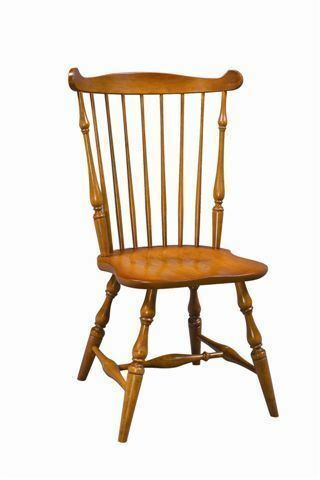 The Amish Asheville Fanback Windsor Dining Chair is a lovely match for our Amish Round Drop Leaf Dining Table. What a gorgeous set this would be for a country kitchen. A Windsor chair from DutchCrafters is built with the finest by skilled Amish craftsmen. Amish furniture made of solid wood will outlast other furniture made of lesser materials. We can't wait for you to start enjoying your new chairs. Please email or call an Amish Furniture Specialist with any questions. Thank you for shopping DutchCrafters. Widest Point on Back of Chair: 22 ½"
I just picked up my Nantucket dining chairs yesterday and I wanted you to know how happy I am with them. They are exactly what I wanted and turned out beautifully. Thanks again.